Is there repetition or is there insistence. I am inclined to believe there is no such thing as repetition. 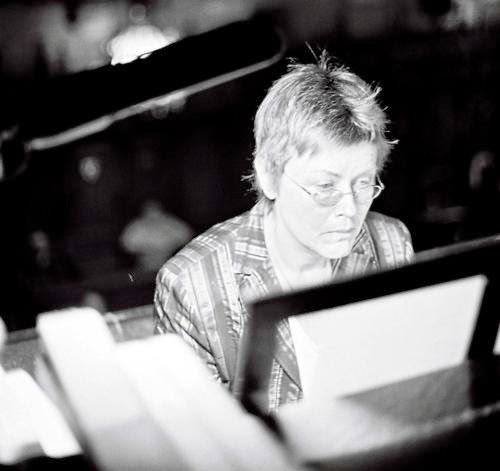 I wrote about composer Eva-Maria Houben last Spring, observing that ... Houben (is) notable, however, for sustaining our attention in music exquisitely poised between a sound and its decay, a melody and its absence, and the vitality possible in repetition and iteration. Listening to Houben...I am faced with that fluid and volatile thing, my preferences, as Wallace Stevens said, between the beauty of inflections/Or the beauty of innuendoes. One night, listening through 'orgelbuch' repeatedly, I sensed preference drop away, and I heard the presence of silence, and I realized how incredibly rare a thing Houben is creating. Spending time with Houben's Lost In Dreams - works for piano, released in June 2013 on Edition Wandelweiser Records, reinforces my appreciation for the depth of Houben's exploration of sound and just after. Equally, in these six piano pieces played by Houben, I am alerted to another fantastic quality of her work - the relationship between what, on one level, is mere repetition, but on another level can be heard/felt as a gentle insistence. This is an insistence perhaps best conveyed in an indication found throughout an earlier Houben piano piece, go and stop - zeit lassen. In his liner notes for Ms. Houben's excellent Piano Music (Irritable Hedgehog), William Robin suggests zeit lassen might be understood as an indication that the pianist grant silence and forget about time as conventionally understood. It is indeed the sort of insistence one can experience in dreams. Lost In Dreams comprises six pieces - Traumverloren I Für Klavier (2010), unfurling for over 30 minutes, its duration suited to Houben's clarifying this soft insistence embedded within mere repetition; and five dedicatory pieces of much shorter duration, bearing the titles in memoriam - Mussorgsky, Enescu, Schumann, Liszt and Messiaen. These brief epitaths privilege the presence of silence as much as any of Houben's works, with a surprisingly spry turn in the Enescu piece, sounding a little reminiscent of some of Cage's toy piano naïveté. How is repetition - perceived by many as an irritant when present in art (Stein suffered this criticism constantly - her essay, from which the above quote is lifted, is in part a response to her detractors, one worthy of a zen master's "slap" to the errant novice during dokusan) - also heard as the quality of granting or allowing time, and silence, to be present? into summer. The earth grants. I have always loved the choice of grants, or in German, zugeben, a lovely turning word, conveying how nature, in her manner of operations, really works, despite the repetition of work and worry. This is why learning that Ms. Houben indicated zeit lassen in her piano work grabbed me - grant time, her work seems to insist, there is no such thing as repetition, simply making music that grants time, sound, and silence. Anyway that is the way it is. And you hear it even if you do not say it in the way I say it as I hear it. My thanks to Michael Pisaro for providing the word zugeben.